Pics and Kicks: Eddie Aikau. We hung out at the Eddie all day yesterday. 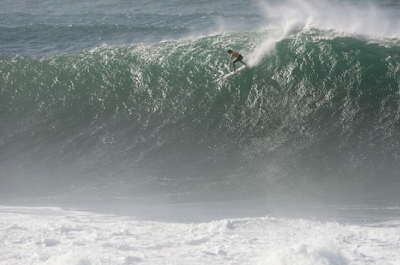 You haven't lived until you've seen big wave surfing at Waimea. The kids were on the live feed of the contest, again. No one can resist all these little blond groms. . . They may have been more excited to see him than Santa. Actually, no, not at all really. They were surprisingly underwhelmed truth be told. Richie on the other hand?? Stoked out of his mind. or we would have sang you a ditty. Y'all should know that bff Andy surfed Waimea the day before the Eddie. yeah that and Andy has a death wish. I heard about that, Andy! Oh, my gosh! You MUST have a death wish! Happy Birthday! I'd give anything to have seen the little boys on the video! Dang. Was the sound of those gigantic waves unbelievable? and seriously, wasn't it AWESOME!! Andy's Richie's bff from childhood's little brother . . . does that make any sense?? OH! He's Chris Pierce's brother!! I just looked at this picture again, but this time I scrolled and cut off the bottom 3/4. Even when all you can see is the surfer and a fraction of the wave--it still looks huge. Then, when you scroll down and reveal the entire face . . . well, that's when you just have to use the word frickin' --HOLY FRICKIN' HUGE WAVE!! How did Andy survive bigger waves that this? !